Liliana’s static ability is very standard for black, but has rarely been seen in such a resilient and multifaceted form. Enchantments are great, but green and white are good at dealing with them and are going to try to do so at very opportunity, as they know a lot of black’s tricks from being on the receiving end of them. Creatures are great, but black of all colors knows just how fragile they can be. Planeswalkers like this version of Liliana certainly have vulnerabilities, but they can be defended by things your deck was doing anyway – and Liliana’s abilities tend towards defending herself very effectively. I also love that her ultimate doesn’t stop with just creatures and lands or whatever else black is good at destroying on lower-rarity cards: when Bolas is coming for you, that’s no time to either hold back or fight fair. It’s one of black’s few Modern-legal direct countermeasures against enchantments on the table, although her cost is rather high for some competitive matchups. And for the record, that apparently leaked or semi-revealed card that hints at Liliana’s triumph (mainly by being named “Liliana’s Triumph”) is not a marker of any kind of writing, including bad writing. If, for some reason, you enjoy stories where every character you like dies for no reason each time there’s a major plot point, there’s always Game of Thrones. Undeath becomes her, it turns out. Liliana might have been forced to pledge fealty to the most Evil of dragons, but she’s returned to Ravnica in time for the grand climax. Whether or not she’s able to free herself from the talons of the self-proclaimed Dragon God is another question, but this Liliana is pretty interesting. The three mythic rare planeswalkers of the set have the usual three activated abilities you have come to know and love, albeit with the bonus static ability thrown in there. 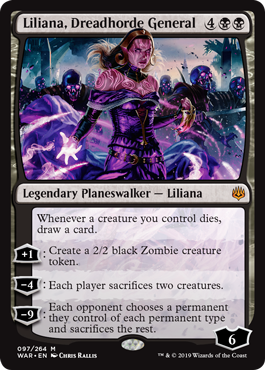 Six loyalty planeswalkers are usually pretty powerful to make up for their high price, and Liliana has a rather nifty static effect to reward you for having loads of creatures (like Zombies). And both her +1 and -4 work well with that; the +1 helps you protect her, and the -4 gives a pretty powerful board-thinning effect that can also draw you cards if you have creatures to sacrifice. Her ultimate is powerful, reminiscent of the infamous white card Cataclysm…albeit now in black, and a bit reminiscent of Liliana of the Veil’s ultimate. This is a way for black to hit artifacts and enchantments, though you don’t get to choose which ones they keep. -9 makes it hard to use her -4 and still tick her up, but proliferate can help with that somewhat, especially with its increased volume here. Make no mistake, this Liliana can end games. She makes minions to block/attack, she compensates you on their death, and she can clear boards. Six mana is a lot to ask for, but I could see her being like Elspeth, Sun’s Champion was from Theros.